Single player. Open world. I guess we're getting this instead of Saints Row 5, but that's probably for the best. IGN is going to be writing about it all month. Gameplay with dev commentary. Gotta skip to around 21 minutes in to actually get to the gameplay bits, tho'. Last edited by Adam Tyner; 04-12-17 at 12:56 PM. Looks like Crackdown crossed with Overwatch. For a game coming out in two weeks, there doesn't seem to be a lot of hype around this one. Yeah. It's not even as if there's a big marketing push that's just not getting any traction. Hardly anyone really seems to be talking about it, positive or negative. Most of the hands-on previews from around E3 were fairly enthusiastic, and the developer streams make it look far more fun than any of the official teasers/character reveals, not that any of that seems to getting much headway. 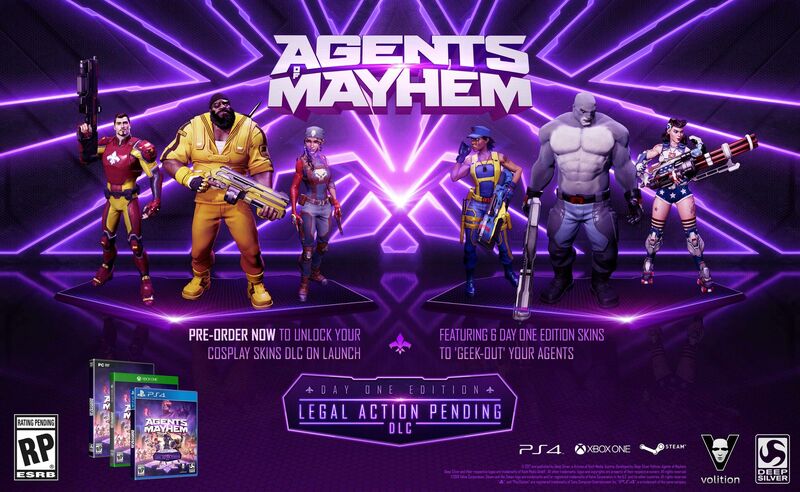 I'm a Saints Row fanatic and will have my copy on day one, but I am expecting this to pull a Dead Rising 4 where it so immediately, spectacularly craters that it'll be close to half-off within a few weeks. I think the issue is that everyone wants Saints Row 5 from this developer, not a new IP. Seems to be getting mixed reviews. 67 on Metacritic. 80 from Game Informer and 4/10 from Gamespot. 2. One of my favorite things about Saints Row is character customization, which is totally absent from this game. I disliked Gat out of Hell for the same reason (well that and the fact that there is hardly any story missions, and they pad the length of the game by forcing you to do all the activities). $5 to buy at Redbox. For that price, I'm almost curious. Apparently the Agents of Mayhem in my local town have been at work. I picked up my copy, and inside the case was a paper copy. I called Redbox, returned it and got a refund. Then I tried picking up another copy at a different box, and the same thing happened. Buncha savages in this town, I'm done. Also, the box where I returned the first one is now showing it available for pickup again, so it hasn't properly been flagged as a fraud copy like they told me it would, so now this can happen to someone else. That Redbox stuff is crazy! I picked this up in the recent XBOX live sales. I saw a hardcopy at the store, and usually I prefer hard copy, but didn't get it, then got the 'of the year' (haha) edition downloadable on sale. After some initial technical glitches - It really didn't like being installed to an external hard drive - on my third restart I really got into it. I'm really enjoying it. It's SR enough to be a little familiar and i like some of the DLC characters and SR references; but it's more Crackdown. I like the squad and instantswitch components. I don't know how long my enjoyment will last, I have heard it gets repetitive, but so far it's a blast. I've unlocked almost all the DLC characters, and story mode, I'm in the middle of unlocking Daisy. I know there's a ton of side missions on the map, most of which (racing, parkour) I don't really care about. So it sounds like they've fixed that part of SR, at least so far. The good news is that it's not one of those open world games that put 80,000 objectives on the map that you're meant to knock out one by one. All that side stuff will repopulate over time, so don't torture yourself doing something if you're not having fun. It'll just keep coming back! I acknowledge Agents of Mayhem's many flaws, but I had a blast with it...enough to score a platinum trophy, which only 0.7% of players had bothered to do. I certainly got sick of the copy/paste underground lairs, and I wish there were more to do in the overworld, but I really love the character-swapping mechanic, I'm a sucker for that '80s-G.I. Joe-by-way-of-Saints-Row aesthetic, and I appreciate how distinct each character is/plays. ...and the skins! Glorious. It's a pretty good first game that could've laid the foundation for a hell of a sequel if...y'know, it hadn't catastrophically flopped. Cool! Yeah, I think I'm able to get connected contracts - I've got a couple characters who are level 9 or 10 and I'm sending them to the world map. I like the fact that i have freedom in the side things. It's not perfect by any means and it doesn't really do anything amazingly new or groundbreaking - it's just fun. And that's what I like about games. Crackdown, Borderlands - they're not Cinematic Masterpieces, but they're fun. Games should be fun! --Mayhem Knows! I picked this up on ps4 when it was on sale for 7 bucks...and I am about 16 hours into it. The game is a blast. I can't put my finger on it, but this game is amazing, especially played on the higher difficulties. Switching out characters is fun and balanced...and getting a new character keeps the game fresh. I honestly am enjoying this game WAY more than I could have ever thought I would. Reviews were completely off on this one.